The level of the East Demerara Water Conservancy (EDWC) last evening was 58.20 Georgetown Datum (GD) and so the Hope Canal project was to have worked through last night draining water into the Atlantic Ocean. GINA said last evening that the level had risen from the 58.1 GD which was recorded Monday evening. Earlier in the day the level rose to 58.25 GD which was experienced on Saturday following consistent rainfall. The conservancy’s height is 59 GD. Head of the National Drainage and Irrigation Authority (NDIA), Lionel Wordsworth told the Government Information Agency (GINA) last evening that 54 millimetres (mm) of rainfall was experienced at Flagstaff, hence the rise in the EDWC’s level. 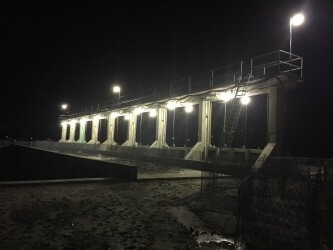 He said that water was released from the Northern Relief Channel of the Hope-Dochfour outlet yesterday via the eight-door sluice into the Atlantic Ocean from 6:00hrs and would continue throughout last night. Temporary lighting has been installed to ensure that workers can monitor the release in the vicinity of the cut that was made at the head regulator. Wordsworth told GINA that the water level in the Northern Relief Channel was maintained at 56.75 GD yesterday, prior to its release through the eight-door sluice. He said because the level is high, monitoring will be conducted round the clock, and discharge will be done today as well. The Northern Relief Channel became the first option over the use of the Maduni and Lama sluices because those could flooding in the Mahaica and Mahaicony areas. Water is also being discharged from the EDWC through the Kofi, Cunha and Land of Canaan relief sluices into the Demerara River. Since 2005, the EDWC has posed a great flood threat. 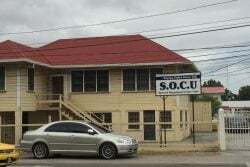 Critics have said that it had been poorly maintained for many years prior to 2005.